Renowned throughout the world as a centre of learning, and latterly as the home of Inspectors Morse and Lewis, Oxford blends medieval charm with the buzz of a modern city. The city may have given her name to everything from a prestigious dictionary to a bitter marmalade, but it is the university that most people associate with the town. Over the past eight centuries eminent scientists, philosophers, authors, archbishops, explorers and politicians have emerged from its ivory towers. Oxford is an international city on an intimate scale. One minute you can be pushing through crowded shopping streets, the next diving down a serene cobbled alleyway, its ancient stone walls laced with wisteria, or stepping through one of the college gatehouses into an enclosed and enigmatic world. 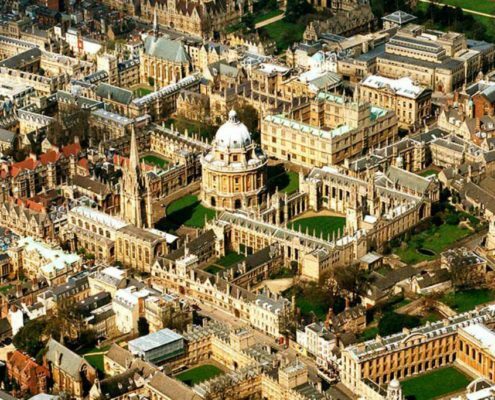 You can walk across Oxford’s medieval heart in less than 20 minutes, though on your way don’t be surprised to find a famous face crossing your path, or to catch yourself eavesdropping on snatches of conversation that range from philosophy to politics to physics. Yet despite its lofty, intellectual air there’s a modern dynamism about the city, which bustles with small businesses, intriguing cafés, quirky shops and and restaurants in the country.